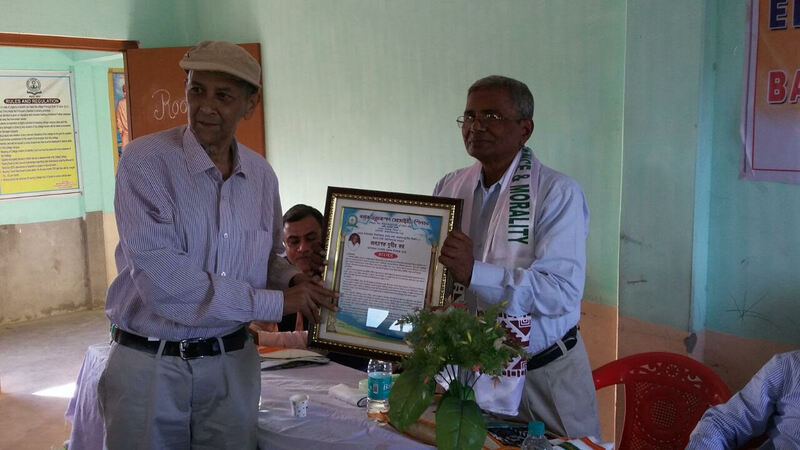 Reputed retired teacher of Judhistir Saha H.S.School , Cachar and columnist of Dainik Samayik Prasanga, Silchar , Shri Kalyan Deshmukhya has been felicitated by Barak Education Society on the occasion of 10th National Education Day observed at Silchar on the 11th November, 2017.Certificate of honour is handed over to him by Professor Alok Tripathi, Department of History, AUS. 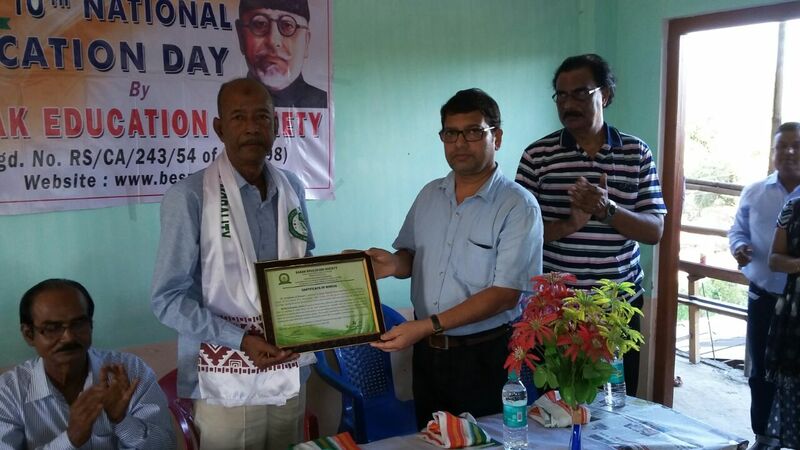 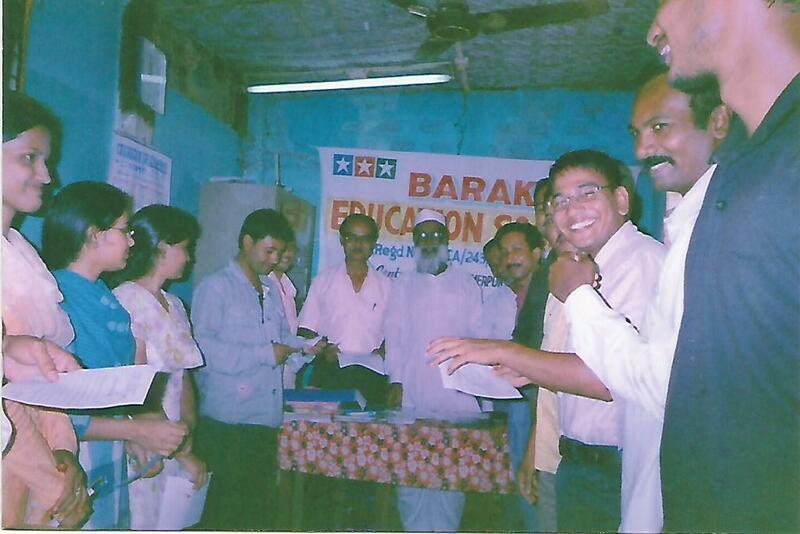 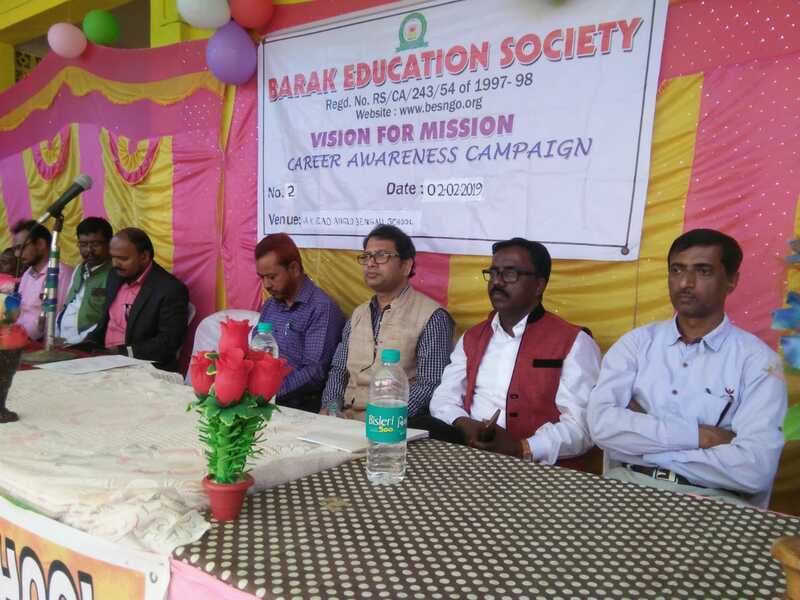 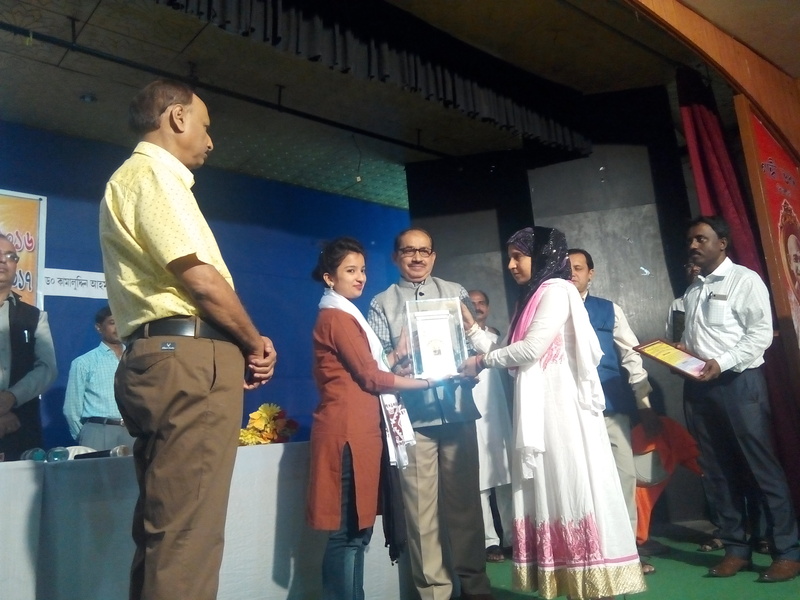 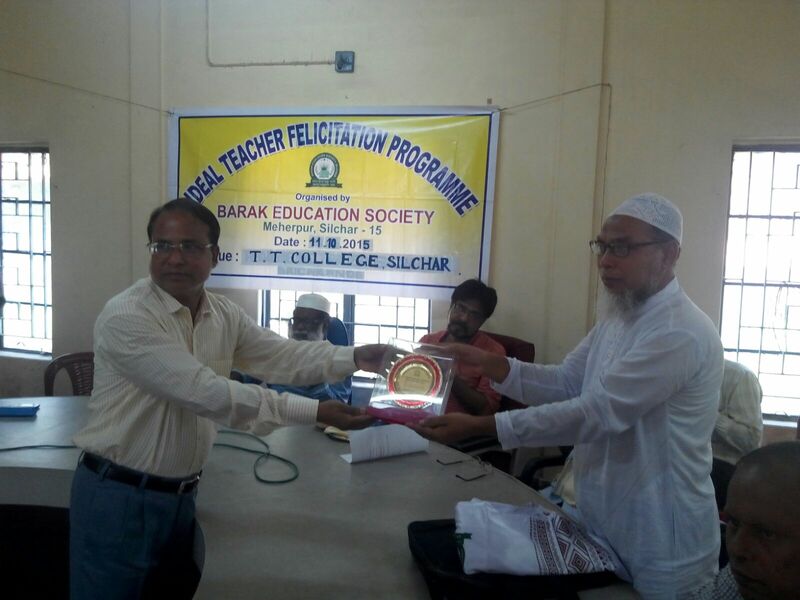 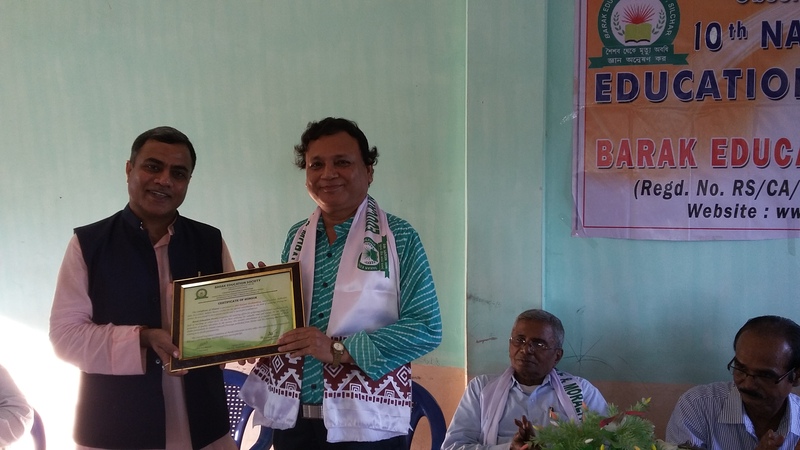 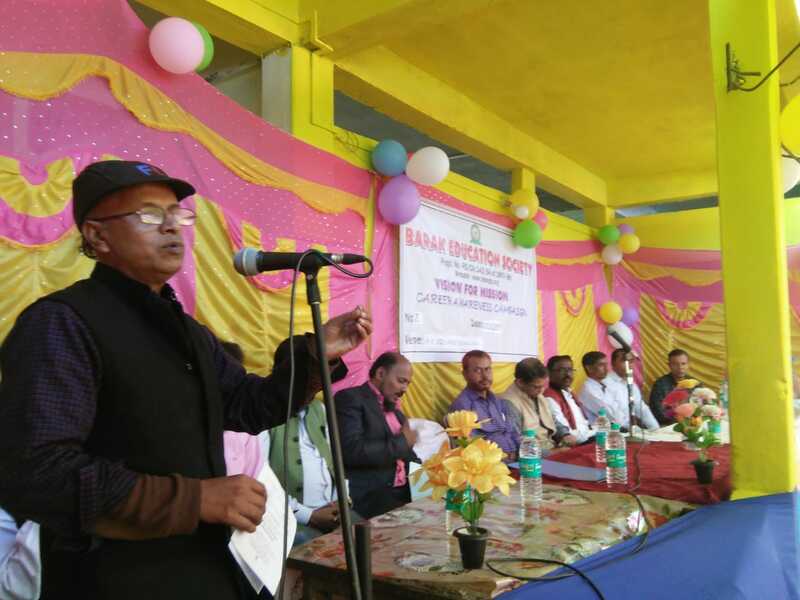 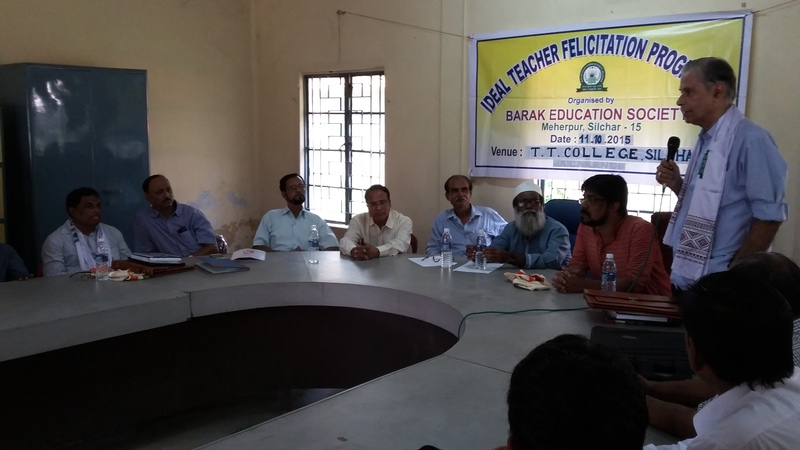 Reputed teacher and retired Principal, Sirajul Ali H.S.School, Cachar, Janab Khairul Anam Barbhuiya has been felicitated by Barak Education Society on the occasion of the 10th National Education Day observed at Silchar on the 11th November, 2017. 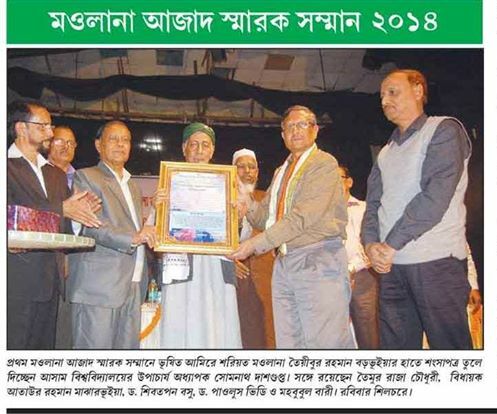 Certificate of honour is handed over to him by Dr. Ala Uddin Mandol, Asstt Professor, Department of Bengali, AUS. 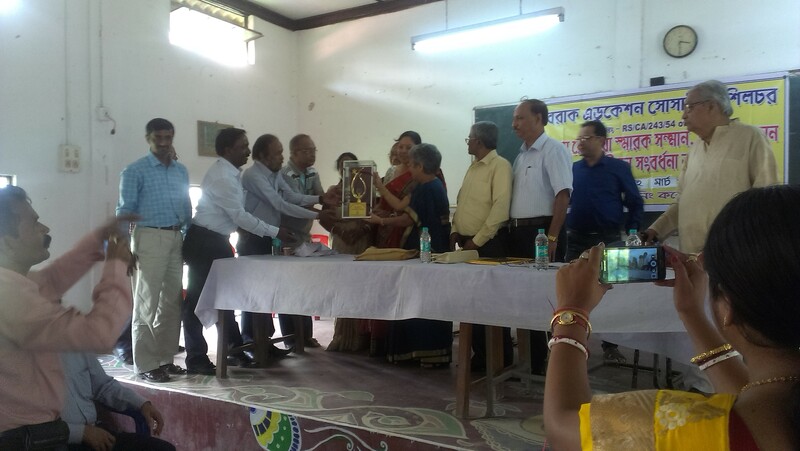 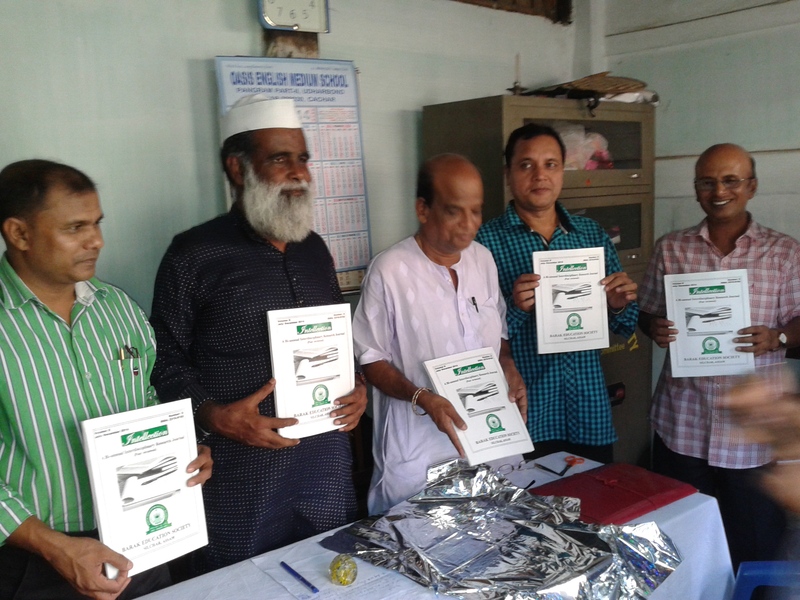 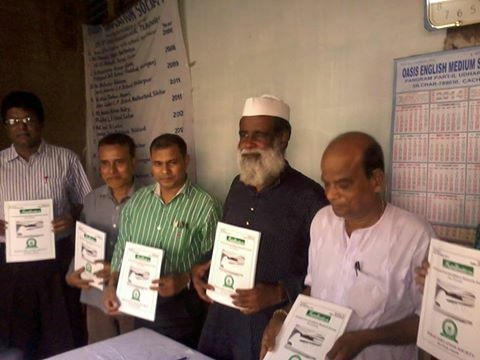 The Editor, Managing Editor and others have inaugurated the 9th issue of Intellection at the central office of the society at Meherpur, Silchar. 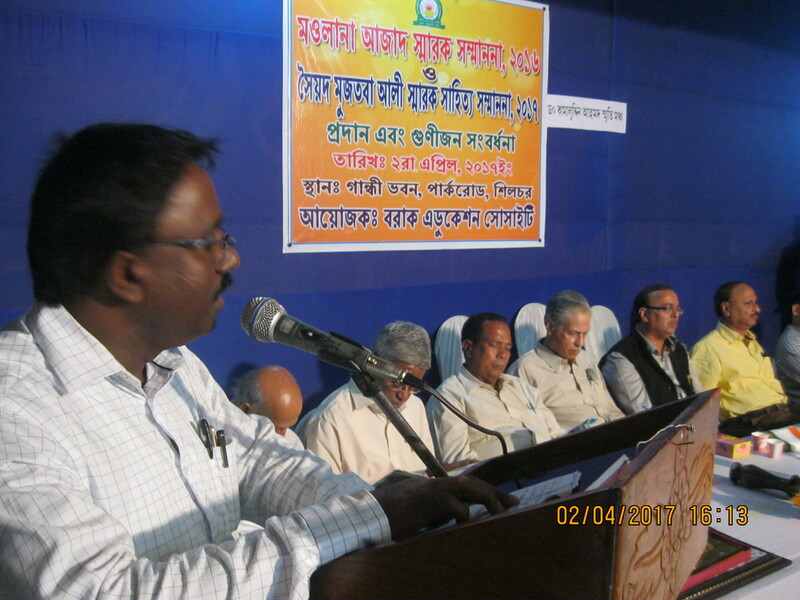 Dr. Amalendu Bhattacharjee, retd Professor, G.C.College, Silchar and Folklore Researcher delivering first Syed Mujtaba Ali Memorial Lecture organized by Barak Education Society at Gandhi Bhavan, Silchar on the 2nd April, 2017. 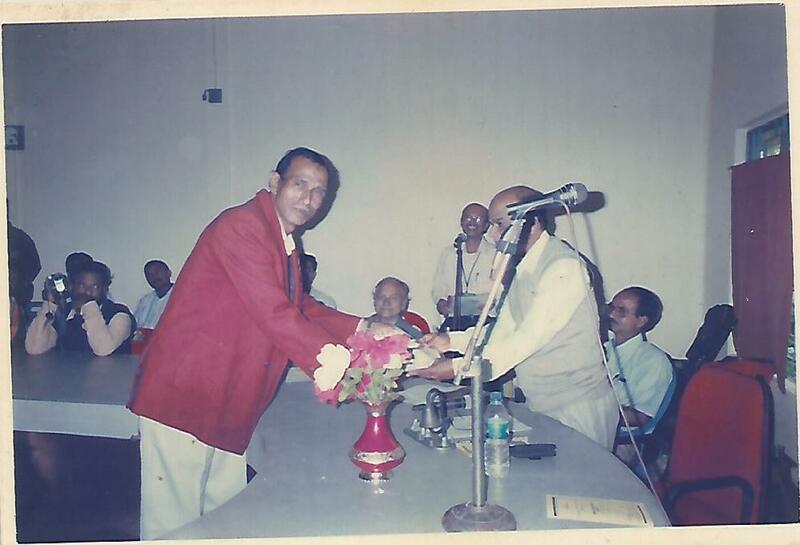 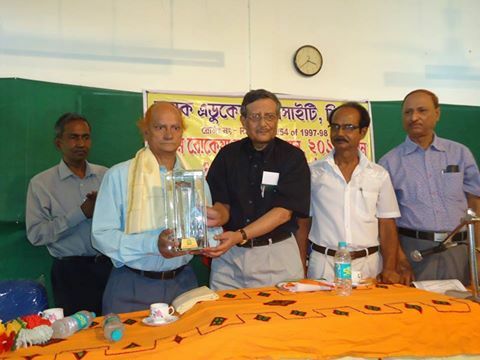 Prof Dilip Chandra Nath, Vice Chancellor, Assam University and Chief Patron Barak Education Society is handing over Syed Mujtaba Ali Sahitya Smarak Sammanana posthumously given to renowned historian, writer and social scientist late Dr. Kamal Uddin Ahmed. 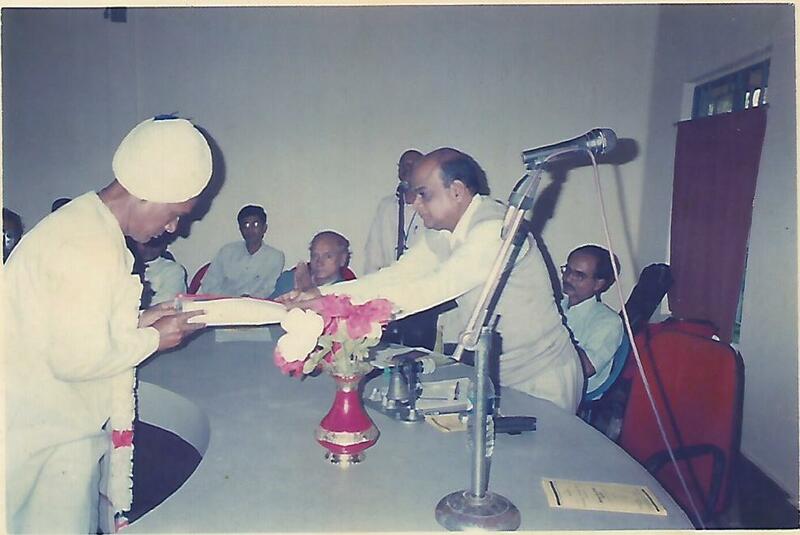 The smarak is received by his grand daughter on behalf of the family. 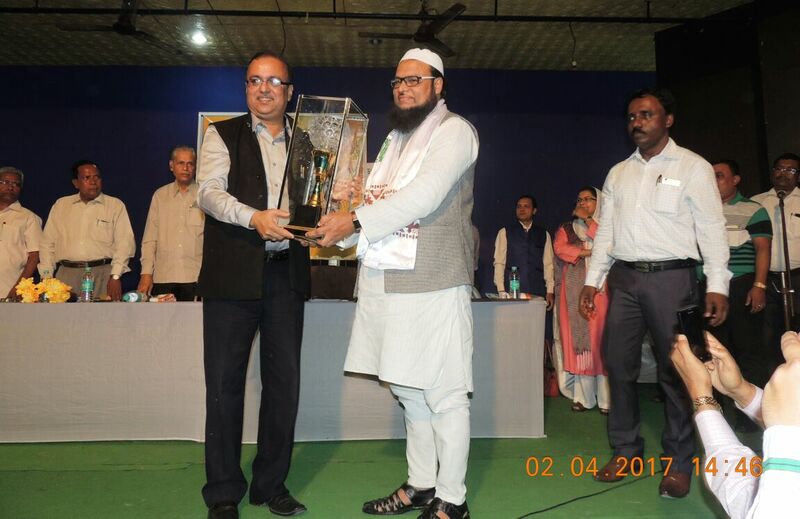 Prof Rajat Gupta, Director, NIT, Silchar giving away Moulana Azad Smarak Sammanana, 2016 to Janab Mahbubul Hoque, Chancellor, USTM at the function held at Gandhi Bhavan, Silchar 0n the 2nd April, 2017. 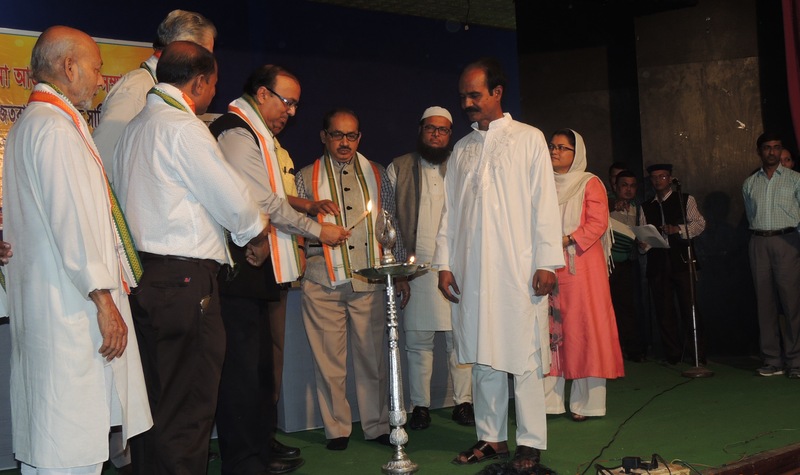 Prof Rajat Gupta, Director, NIT, Silchar lighting the lamp at the inaugural function of the Award Giving Programme of the society held on the 2nd April, 2017 at Gandhi Bhavan, Silchar. 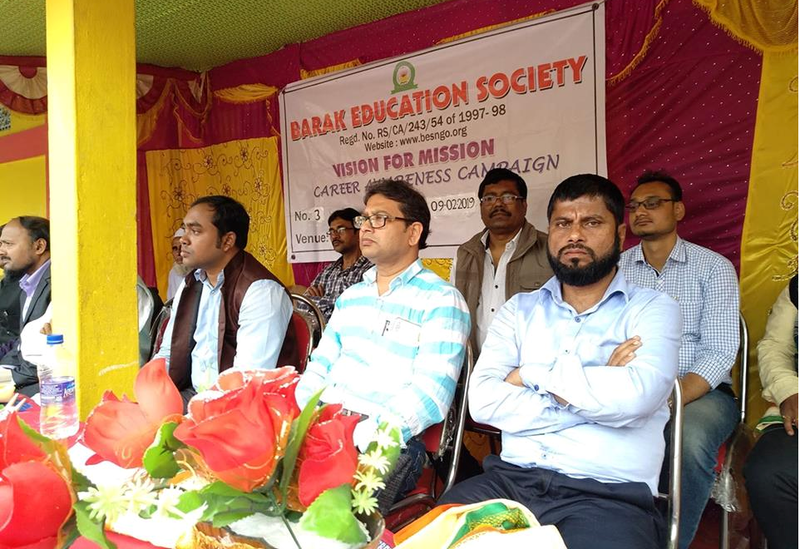 Prof Dilip Chandra Nath , Vice Chancellor, Assam University and Jb Mahbubul Hoque, Chancellor ,USTM among other dignitaries participated on that occasion. 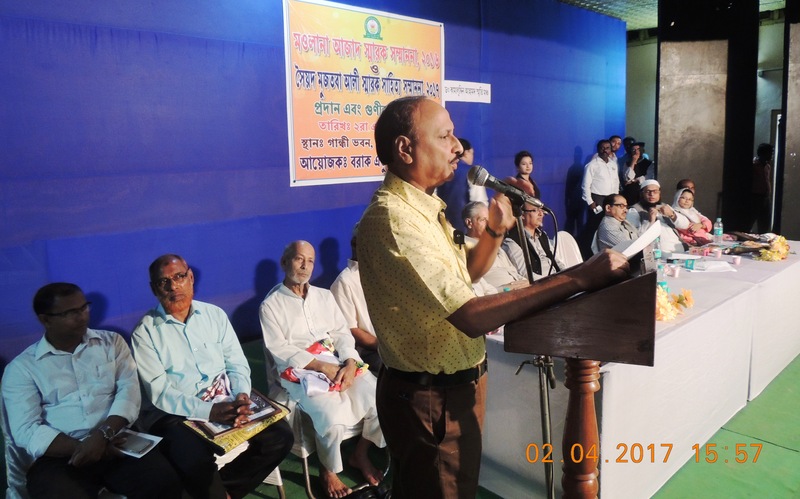 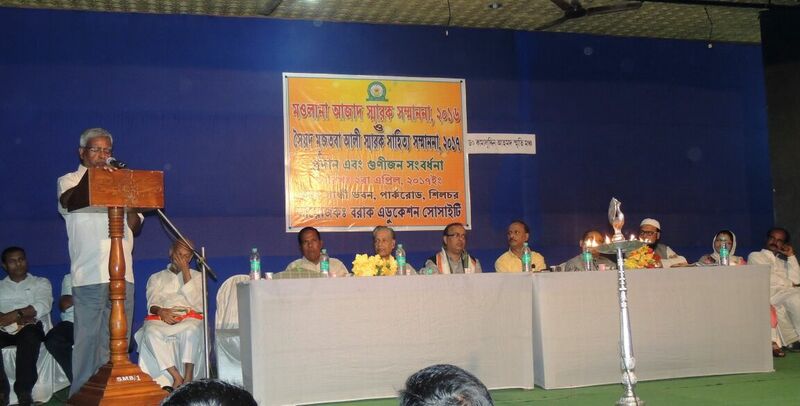 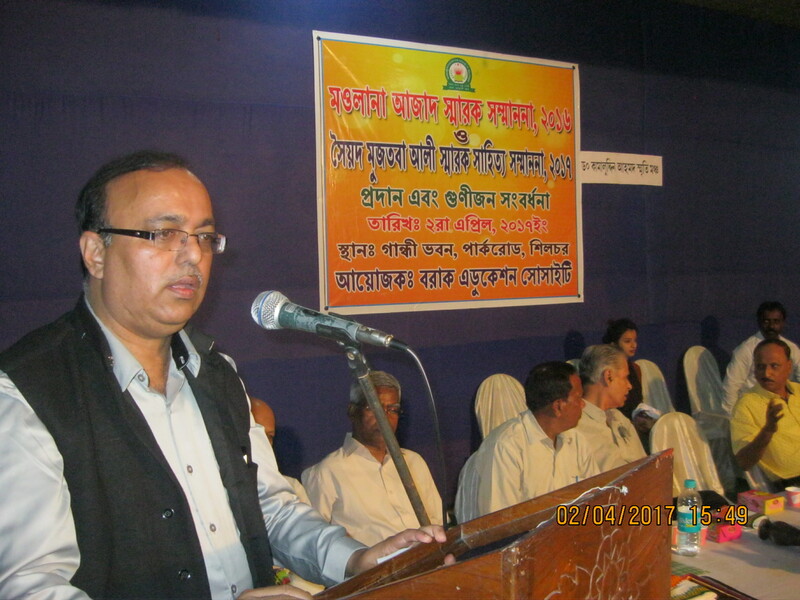 Jb Taimur Raja Choudhury, Chief Advisor, Barak Education Society and Editor, Dainik Samayik Prasanga delivering Presidential Speech at the Award Giving Programme held on the 2nd April, 2017 at Gandhi Bhavan, Silchar. 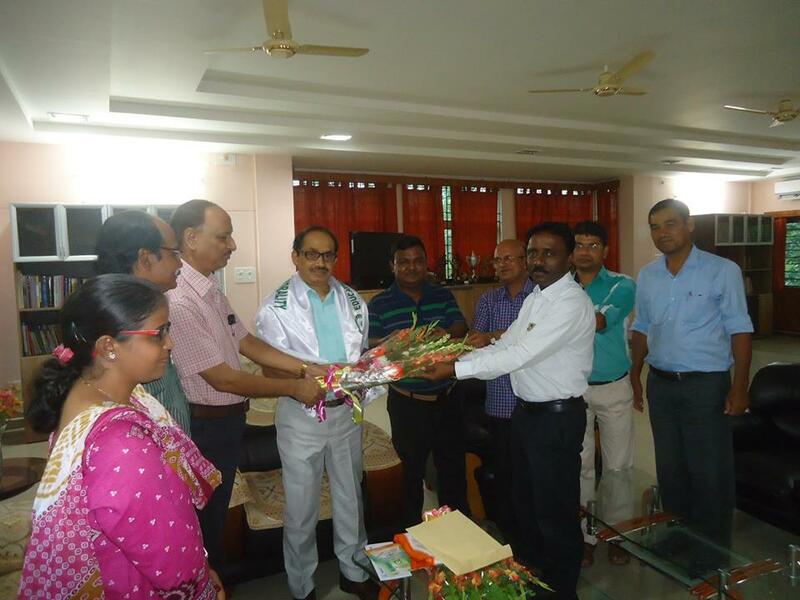 Chief Advisor, President, General Secretory & other office bearers of BES giving formal reception to Prof. Dilip Chandra Nath, Vice Chancellor, Assam University as Chief Patron of the society on May 27, 2016 at his office. 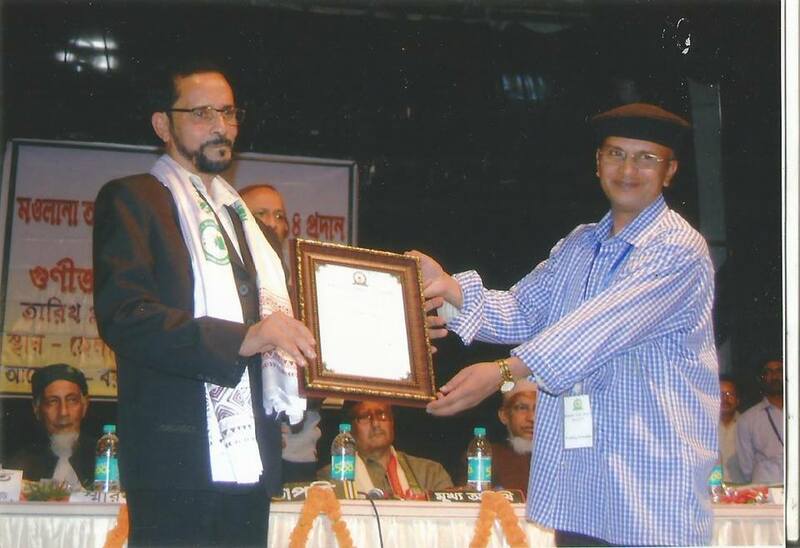 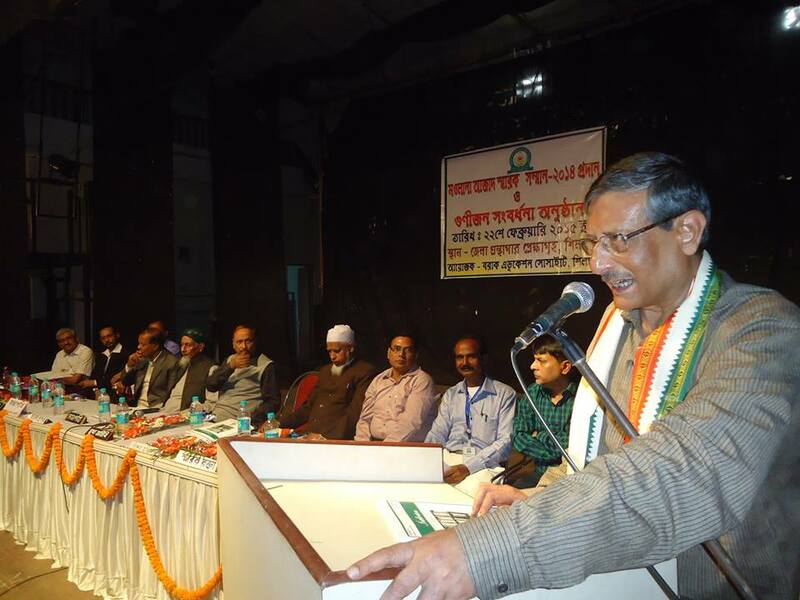 Prof. Somnath Dasgupta, VC, Assam University handing over the citation for Maulana Azad Smarak Samman 2014 to Maulana Tayebur Rahman Barbhuiya, Renowned Educationist and Amir-e-Shariat, NE India. 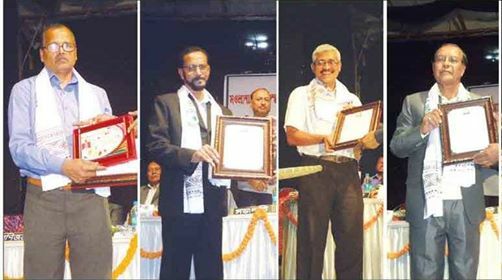 Four reputed persons viz (from left) Dr. Paulose V.D., renowned English poet, Mahbubul Bari, renowned social worker and folklore researcher, Dr. Ravi R. Kannan of cachar Cancer Hospital and Dr. Shibtapan Basu, renowned writer and former principal N.C. College are being felicitated. 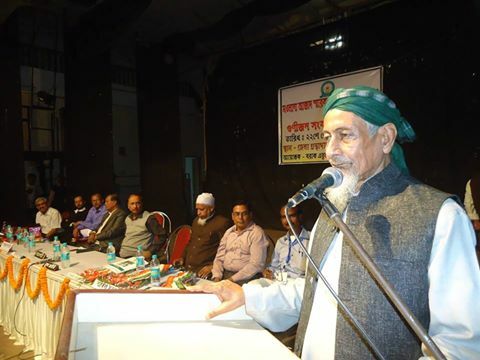 In the eve of organizing Maulana Azad Smarak Samman 2014 award function members, advisers and patrons are adressing before the press. 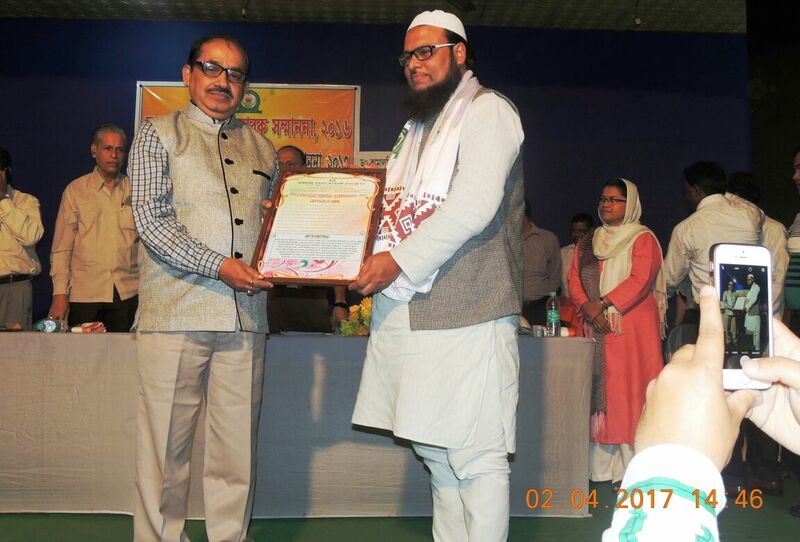 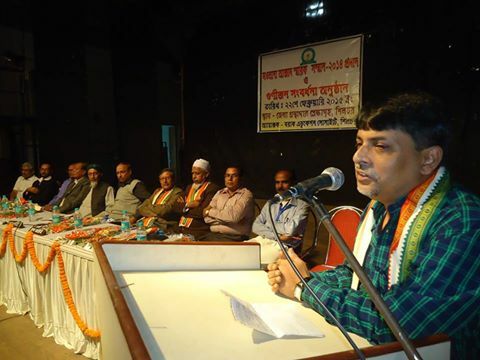 Among others Maulana Ataur Rahman Mazarbhuya, MLA and Taimur Raja Choudhury, editor Dainik Samayik Prasanga was present. 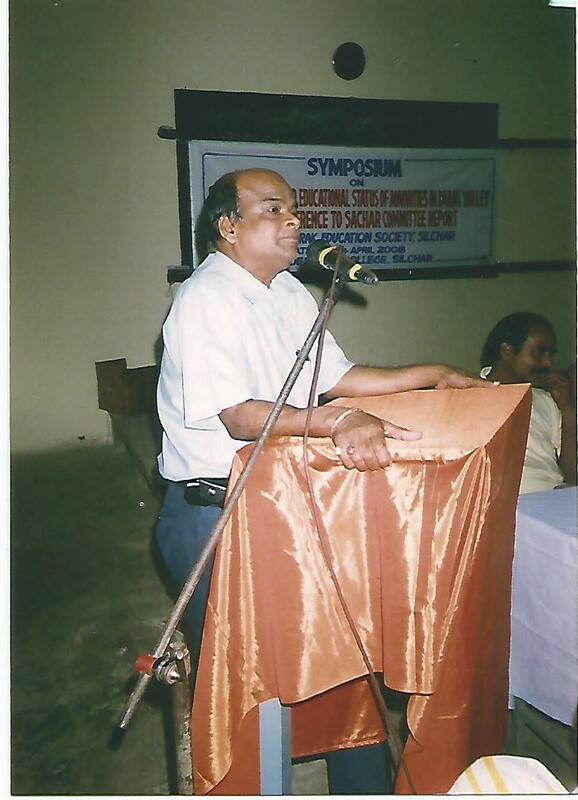 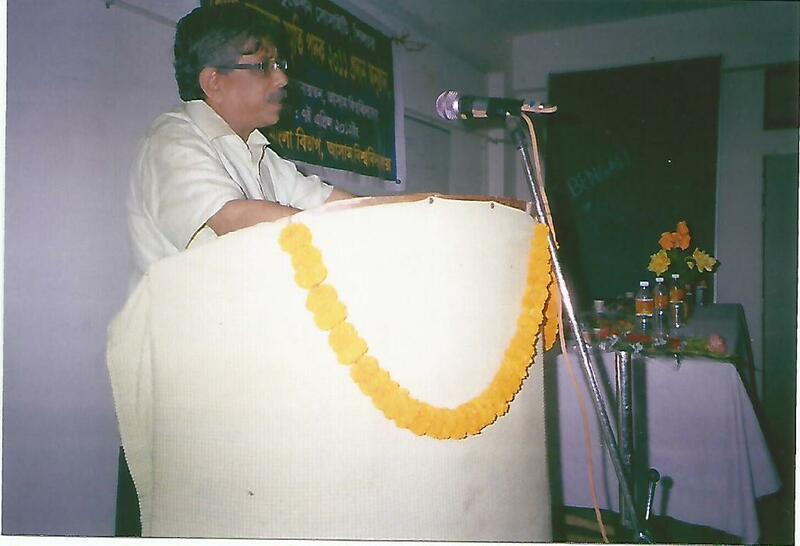 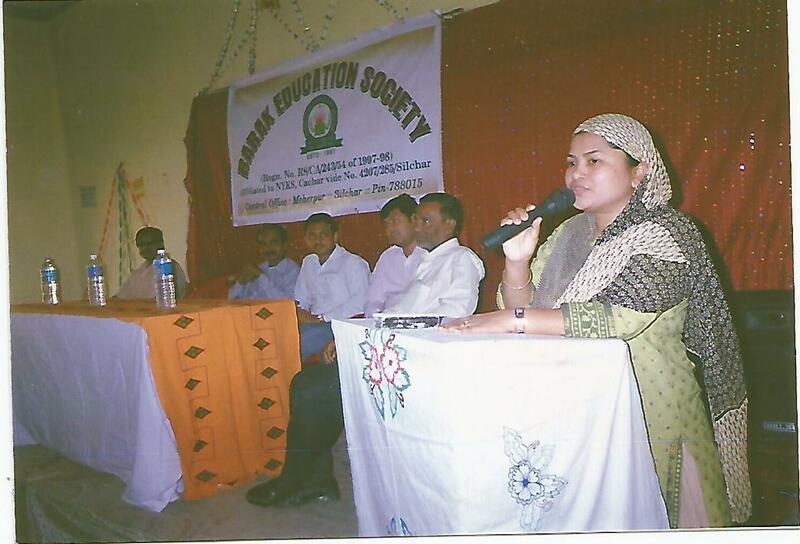 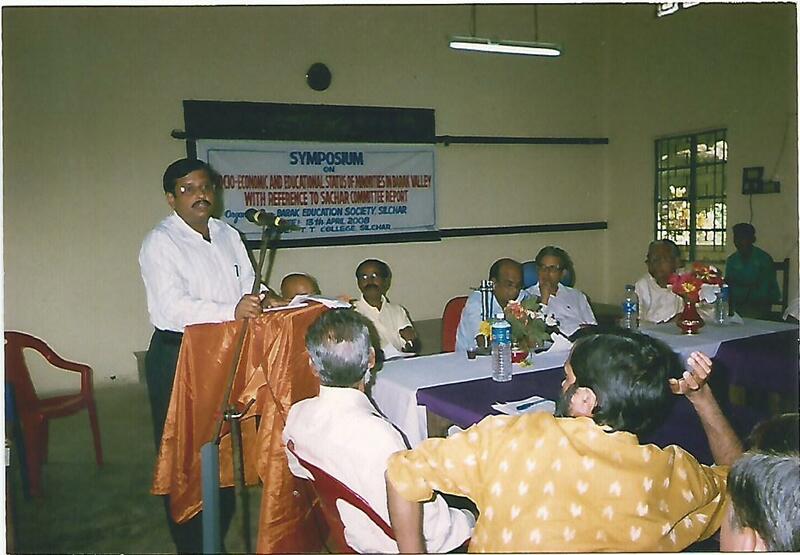 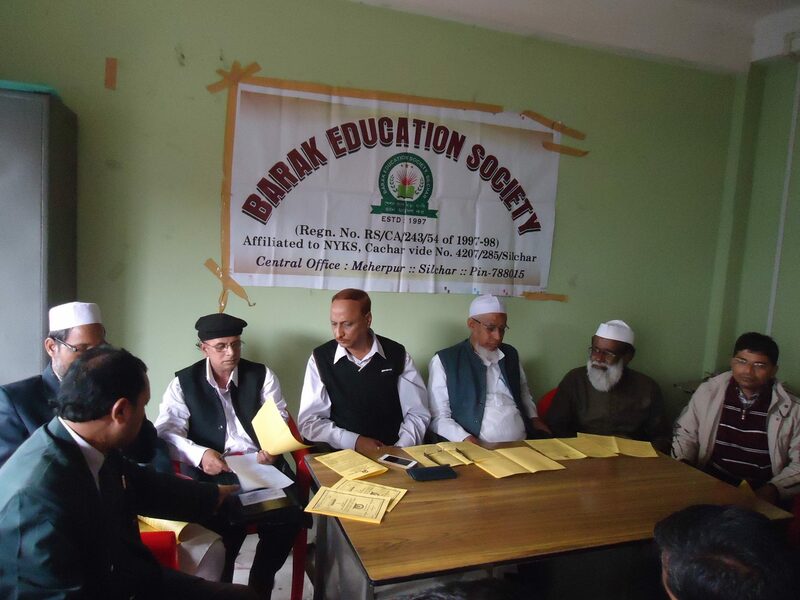 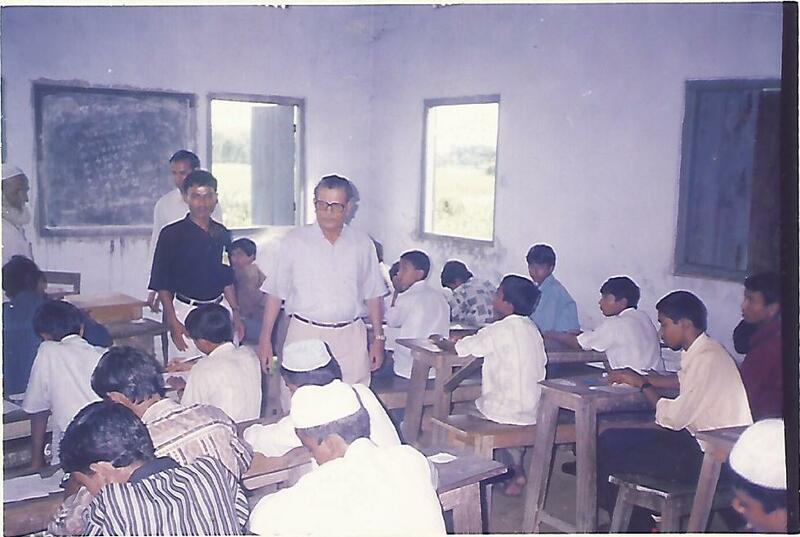 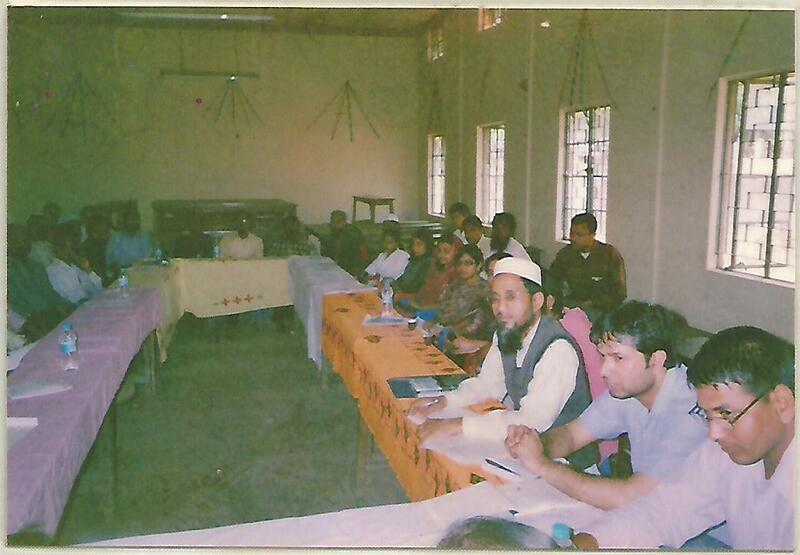 Prof Nikunja Bihari Biswas, Department of Education, Assam University delivering lecture on the occasion of symposium on the socio-educational Status of Muslims of Barak Valley with reference to Sachar Committee Report in 2008 A.D.
Prof. Tapodhir Bhattacharjee, Vice-Chancellor, Assam University, Silchar delivering lecture on the occasion of awarding Begum Rokeya Smarak Samman to Dr. Tanushree Ghosh. 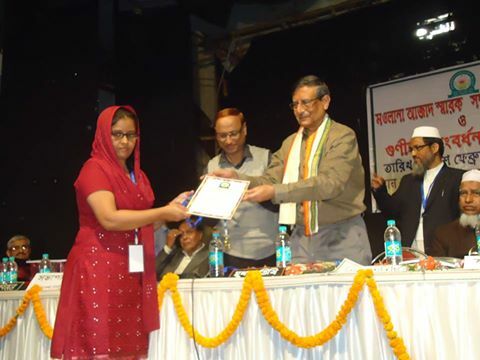 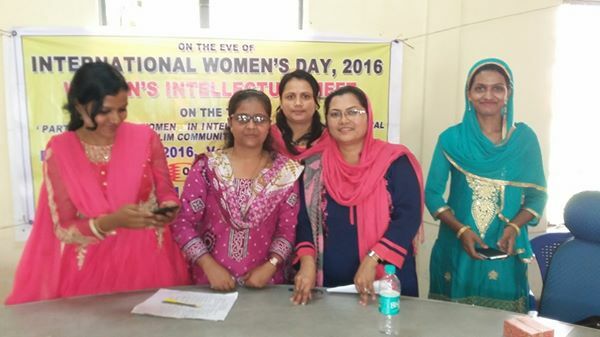 Dr. Shahin Ara Begum, Associate Professor, Department of Computer Science, Assam University at the 13th Foundation Day of the society.